I don’t know about y’all, but I am in complete denial that August is merely a week away. Wasn’t the last day of school just a few weeks ago, and the Fourth of July, like, yesterday? I’m going to roll with that last one, because I looked up this weekend and realized that I still have my mantle decked out in red, white, and blue. So I decided to remedy that. It was high time to swap out my America the Beautiful printable with something that will help me hold tight to this last precious month of summer vacation. 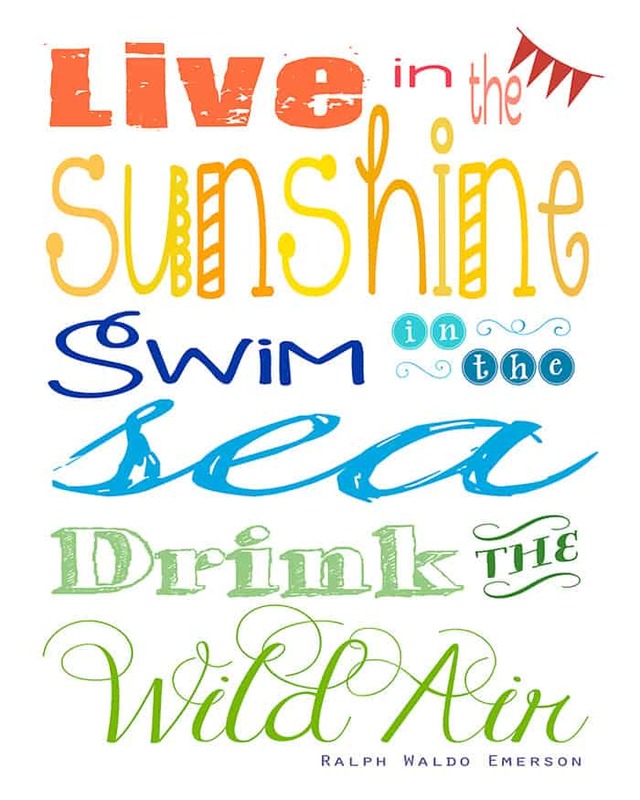 Ralph Waldo Emerson captured the essence of summer pretty perfectly with this one, don’t you think? Since my baby was born a few weeks after my eldest started Kindergarten last fall, this summer has actually been the first time that I’ve had all three kids home with me all day, every day. I half expected that it was going to drive me a little looney, but the truth is I’ve actually enjoyed it. I’m going to miss my big boy when he heads back to first grade, and I’m not totally excited about the busy schedule that’s going to ensue again once the school year kicks into gear. I know, I know…here I am whining when I only have one kiddo in school so far, and don’t I know how crazy life is going to be when all three of them are in school + extra-curricular activities? So I’m savoring the remaining laid-back days of summer while I can. But the end of summer is interlaced with things to look forward to as well. The promise of a new school year is actually pretty exciting, college football season commences (whoop! ), there’s cooler weather to anticipate (you know, around November for those of us in Texas), and of course, so many fun holidays fall in the second half of the year. So as much as I love the sunshine and the sea and the wild air, every season is actually pretty glorious in its own way if you think about it. Things are already picking up around here as July wanes. We have a little family get-away coming up, a birthday party to throw, and back-to-school preparations to tackle. Since I started this blog on June 1st, I’ve been posting five days a week, but it’s very likely that as we get back into the swing of the school year, I’ll have to cut that back by a day or so. Some weeks I’ll still crank out five posts, but if it’s a particularly busy week, I may only be able to manage three. I really love the creative outlet that blogging has afforded me, and I’ve already made connections to so many amazing bloggers and warm and welcoming readers, so thank you all for the encouragement and support as I’ve undertaken this little journey. But my family is and always will be my first priority, and I’m still figuring out how to juggle and balance everything, so I hope you’ll forgive me if I miss a day’s post here and there. Here’s to a wonderful remainder of the summer and a fantastic second half of 2013! 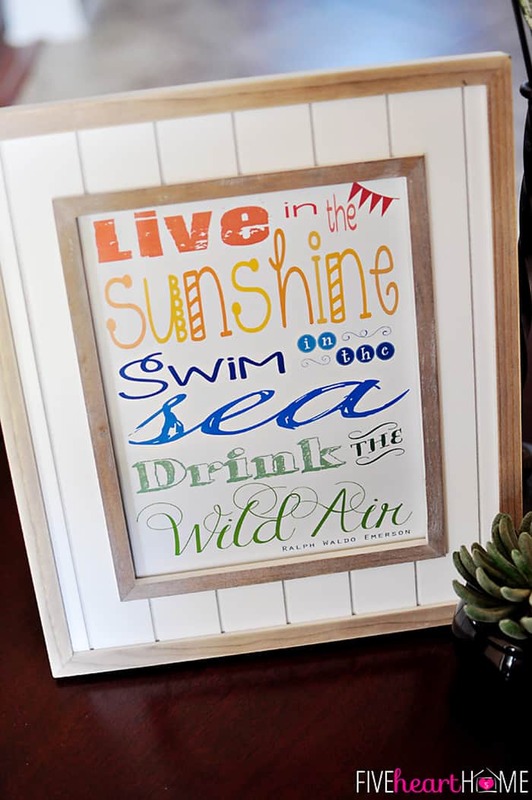 This Summertime Quote Printable is a high-resolution PDF sized to fit in an 8×10-inch frame. You may print it on regular paper or cardstock on your home printer and trim to size, or have it printed as an 8×10 photo at a photo lab. Enjoy! This post is linked to Best of the Weekend Party #14 at A Little Claireification, Kitchen Fun & Crafty Friday Link Party #76 at Kitchen Fun With My 3 Sons, Inspire Me Please Weekend Blog Hop #20 at House of Rose, Hookin Up With HoH #158 at House of Hepworths, and Weekend Wrap-Up Party at Tatertots and Jello. Hi Samantha! 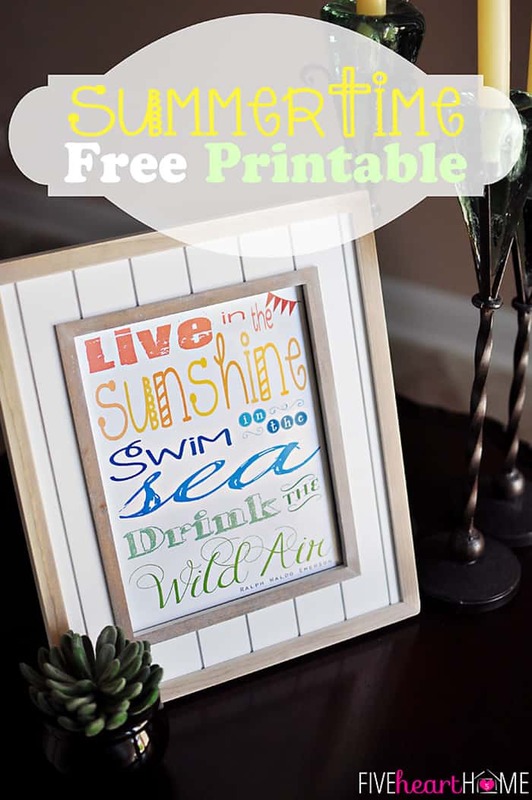 What a perfect summer printable! Thank you so much for joining us and sharing at Best of the Weekend. Pinning to our party board and to my printables board, plus sharing on FB over the weekend. Have a fantastic weekend and hope to see you next week! Thanks so much, Cindy! I was excited to have found y’all’s party. Hope you have a great weekend, too! Love this! I would love for you to share and link up at my weekly TGIF Link Party if you haven’t already this week. Your favorite posts, most popular, recent or new! The party is open every Thursday night and closes Wednesday’s at midnight. Followed by (Not SO) Wordless Wednesday! Thanks for the invite, Cathy! I’ll definitely head over and check it out! You’re very welcome, Madeline! Thanks so much for stopping by! 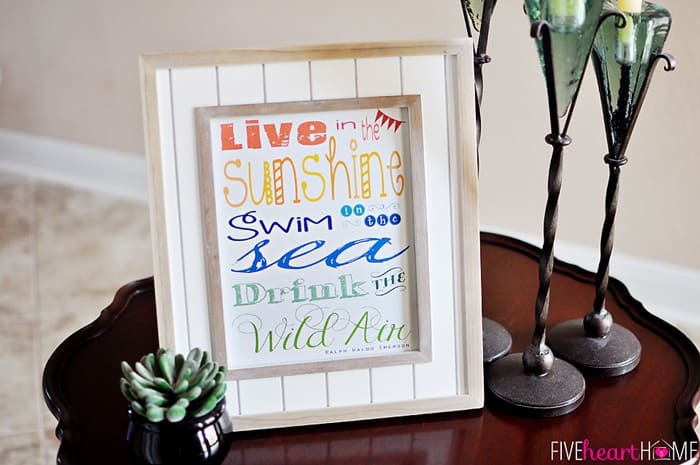 Samantha, this printable is perfect for August, and I LOVE that it’s RWE! 🙂 That frame compliments it beautifully, too. You’re welcome, Amy…I hope you enjoy it! I really love this! Awesome printable!! Thank you:) I really wish I had a mantel (working on that….) this would be so great as part of a summer mantelscape.